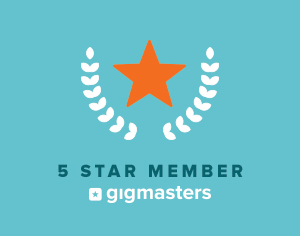 *AWARDED BEST OF GIGMASTERS 7 years in a ROW 2012-2018! * GIgsalad TOP Performer 3 years in a row *TOP ONE MAN BAND IN THE SOUTHEAST. Do you want upbeat live music, but more than just a guitar player, and you don't want the expense and hassle of a full band? Brandon is your guy! He has the talent, hard work, and professionalism you'd expect from a high level musician and he will work tirelessly to exceed your expectations and leave you with an unforgettable experience! Brandon Crocker has been performing for hundreds of weddings, corporate events, parties, and concerts over the past 10 years. And during that time he has been perfecting his craft and has grown a selection of material from JAMES TAYLOR, JOHN MAYER, JACK JOHNSON, ZAC BROWN, VAN MORRISON, JOHN DENVER, STEVIE WONDER and GARTH BROOKS to ERIC CLAPTON and OTIS REDDING….including Blues, Top 40's, Motown, Beach, Pop, Country, Top 90's, 80's and late 60's and 70's folk music and more… and his set list continues to expand. *DJ Services: Brandon will gladly emcee your wedding or event and play your favorite dance music through his Premium QSC System during breaks or for the remainder of the evening...and get everybody on the dance floor! Brandon uses a loop pedal and drum machine which gives a fuller sound like that of a full band, but without the high price tag. Or if you like, Brandon can add a percussionist or a full out trio. He can play as loud or as SOFT as you need. The three biggest compliments he receives are his talent, variety of songs, and his music is soft enough for guests to chat and enjoy the music. Planning a WEDDING? Brandon has been performing entire weddings for years! He can play soft acoustic/classical music for the Ceremony, enjoyable background music for Cocktail hour and Dinner, and then take it WAY UP on the dance floor for the reception to get the party started. He can sing part of the reception and then switch to DJ the last portion of the night getting people on the dance floor playing Today's Top Hits with his 4,000 watt State of the art PA system. Brandon uses only the highest quality equipment and can setup in both small and large settings quickly and easily. He is a pro at reading the crowd and can customize his playlist to your specific event whether it is upbeat crowd pleasers or easy listening background music. When you hire Brandon, you can feel confident that in return you will get a highly PROFESSIONAL show from a GIFTED musician. He will work with you from beginning to end. Brandon will give you a performance that will leave you and your guests wanting more!